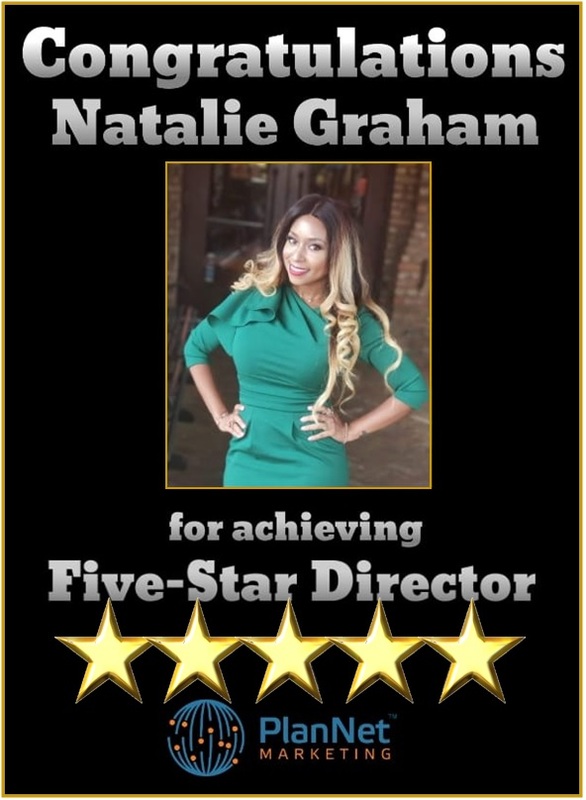 CONGRATULATIONS TO NATALIE GRAHAM FOR ACHIEVING FIVE-STAR DIRECTOR! PlanNet Marketing is proud to announce our newest Five-Star Director, Natalie Graham! To achieve this prestigious rank, a Five-Star Director must have 4,000 active ITAs in their downline. Natalie joins 5-Star Directors Shedrick White and Orlanda Moore as the third member of this elite club. Director Graham says, “It's amazing the things that happen when you not only just pray for them, but put in the work! Three years ago, I prayed and asked, ‘What's my purpose?’ So many around me were finding theirs and all of a sudden it became so clear...‘service to many.’ All my life I've enjoyed making others feel good and it showed through my many career and college choices. I went to college for hospitality management, education, and life coaching. I had a career as a veterinary technician and a massage therapist and I realized that service and helping was what they all had in common. Congratulations to 5-Star Director Natalie Graham from everyone at PlanNet Marketing!